The Seven Cruelest—and Legal—Abuses of Animals in the U.S. In a Sunday New York Times column provoked by two new documentaries—”The Act of Killing,” about the anti-communist massacres in Indonesia in 1965-6, and “Blackfish,” about a SeaWorld orca implicated in the deaths of three people—Nicholas Kristof asked, “Some day, will our descendants be mystified by how good and decent people in the early 21st century—that’s us—could have been so oblivious to the unethical treatment of animals?” They probably will be, and these seven examples will be partly why. 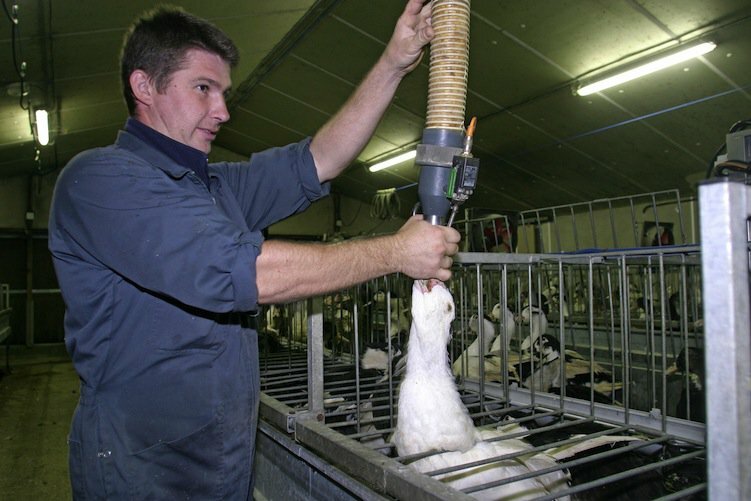 Two or three times a day for a month, ducks are force-fed pounds of cornmeal through a process called gavage—essentially, a tube is forced into the esophagus. Once their livers expand up to six to ten times their original size, the ducks are killed and the liver is served up as foie gras. Chicago banned the expensive delicacy in 2006, but repealed it two years later. Foie gras itself is legal in California, but the state has banned the act of force-feeding birds to enlarge their livers. 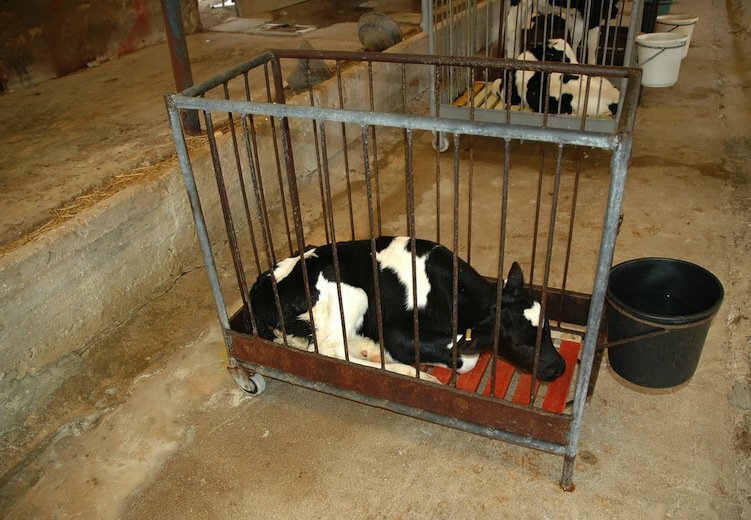 Newborn calves are often kept in crates designed to prevent the calves from even turning around, thereby limiting them from developing muscle tissue and burning calories (the resulting meat is said to be more tender). They’re also deliberately kept anemic to make the meat lighter in color. Bob veal calves, meanwhile, are slaughtered a few weeks or even days after birth. Several states have banned confinement crates. 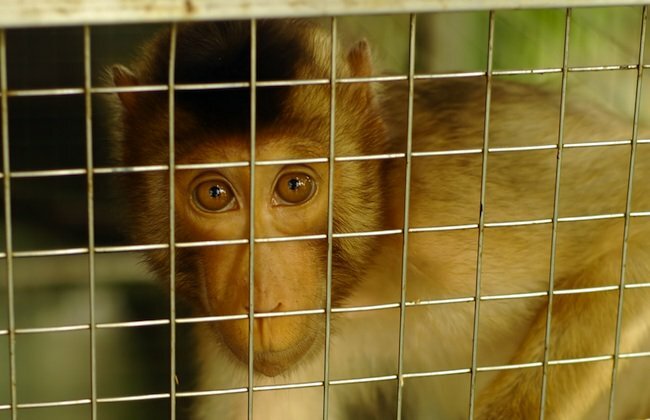 According to PETA, around 125,000 primates are confined in U.S. labs each year—bred, born into laboratories, or captured in the wild. Suffering periods of deprivation and over-stimulation, many suffer from mental illnesses, if they do not die direct effects of the experiments. Multiple educational institutions have been accused of cruelty in their labs. The National Institutes of Health last month announced it is retiring most of its research chimpanzees and the Fish and Wildlife Service has proposed listing the species as endangered. 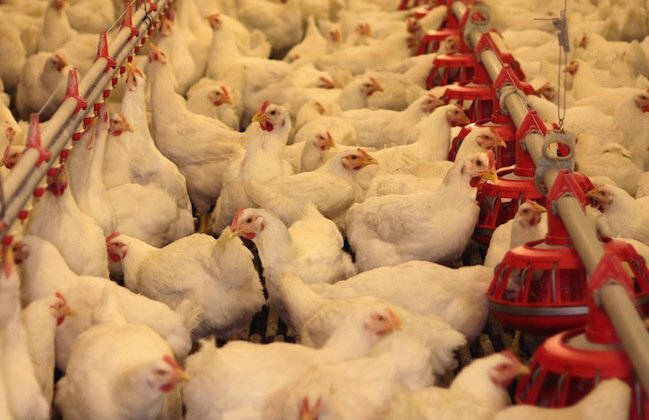 Chickens are often locked in coops of up to 40,000 where, among the feces and ammonia, they develop respiratory diseases and weakened immune systems. Unnatural growth, due to genetic manipulation and drugs, causes many to die of heart attacks or lung collapse; others become too obese to walk. Circuses such as Ringling Bros. allegedly use bullhooks, whips, electric prods, and chains—even blowtorches, in Carson & Barnes’ case—in the process of training their animals to perform. The USDA's Animal and Plant Health Inspection Service is supposed to oversee circuses, but is woefully underfunded and understaffed for the task. 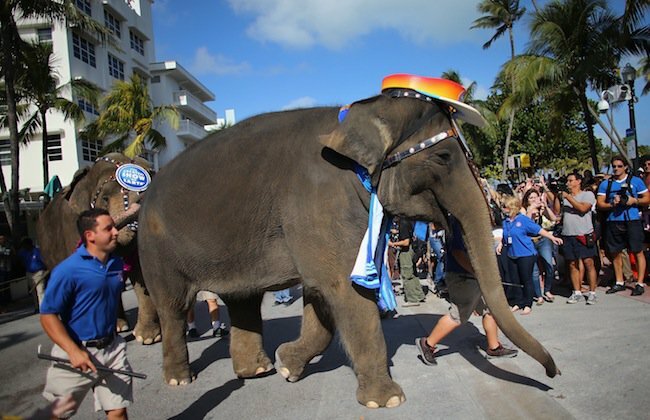 Los Angeles's City Council has recently considered prohibiting elephants from performing in shows in the city. Dogs mass-bred in “puppy mills” are infrequently supplied with the minimal water and food required by law. They are often held in unsanitary wire cages, receiving little attention or contact with others. 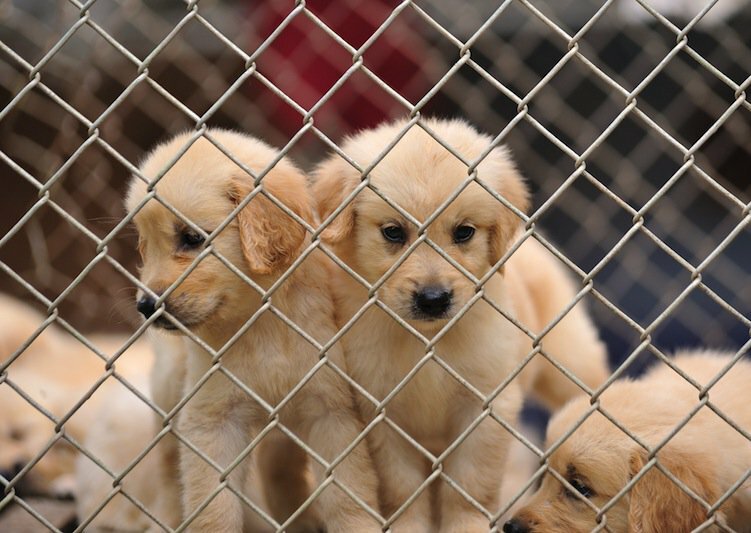 Thirty-two cities nationwide, like Los Angeles and San Diego, have passed legislation banning the sale of any “mill animals” in stores, and in February Congress introduced a bill that would increase government regulation of puppy mills. 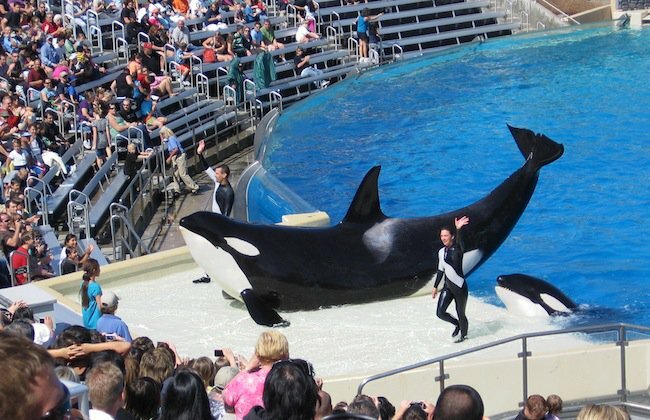 Orcas that become trained performers are no longer captured in the wild—as Tilikum, the orca in “Blackfish,” was—and instead are bred in captivity. But they're confined in artificial pens, which some scientists consider cruel and immoral. The Animal Welfare Act sets the standards for their facilities and care. Apparently that doesn’t prevent recent incidents like this, in which a pilot whale at SeaWorld struggled for at least 25 minutes to get back into the water from a ledge.